5/5: "The leftie in the family loves it! Thank you." 5/5: "Quality items and a real innovation !" 5/5: "Prompt delivery and item as described"
4/5: "Very helpful in school for pupils who struggle with their handwriting"
5/5: "excellent service, will use them again." 4/5: "Pleased with them but quite pricey"
5/5: "Arrived on time and in good condition, absolute bargain!" 4/5: "Bought for my left handed son, he loves them and only uses these pens now"
4/5: "Quick delivery, no problems"
4/5: "The items were purchased for my 8 year old grandson who is left handed. He generally uses a pencil at school but I hope he will practice using the pens at home"
5/5: "quick delivery -WELL DONE THANKYOU"
5/5: "Lovely item and really quick delivery"
5/5: "Came exactly as described." 5/5: "Item arrived promptly and was as described." 5/5: "Very prompt delivery and item is as described." 5/5: "My lefty loves this." 5/5: "Sceptical at first but needed something as broke my right wrist, these pens do actually help me write left handed"
5/5: "Great seller, fast shipping and a great price. Thank you!" 5/5: "I will use amazon more! 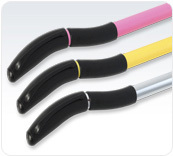 I was very happy with the whole transaction"
5 out of 5: "As a lefty these pens are great!" 4 out of 5: "Good"
5/5: "This order arrived a month early. I am totally pleased and highly recommend this seller." 4/5: "4 stars - nothing to add." 5/5: "Item arrived well within expected delivery times. It was well packaged. " 5/5: "excellent product for us left handers many thanks"
5/5:"After my second order they sent me an extra pen for free"
5/5:"excellent item, fast secure delivery and good customer service, I recommend seller and would use again myself." 5/5:"Arrived quickly and as expected"
5/5:"Item as described, fast delivery "
5/5:"Excellent service, no complaints! " great my daughter has been complaining about the sores she gets on her finger because of the way she writes so when she started college she was so glad that I had found these pens for her, she loves them!!!!! Swan Neck Pens These are comfortable pens to write with. Using them has not fully resolved my wrist and hand cramping, but these pens have helped tremendously. 4/5: "Prompt delivery, item as described, competitive pricing"
"I'm a right handed person and I love these pens. I have RSI problems and find swan neck pens a breath of fresh air. Many Thanks". "Hi, I just wanted to let you know that when I handed the Swan Neck Pen to my son's teacher she told me that she will buy one for her son who is also left handed. The Swan Neck Pen has made a huge improvement to my son's handwriting. His teacher has told me that his writing has improved and he is now more eager than before. I am over the moon. I did buy a different left handed pen a few months ago but my son never wanted to use it. He loves his Swan Neck Pen. I think that all schools should supply Swan Neck Pens for all their left handed children as they do make a huge difference. Many thanks, Amanda". "I bought these Swan Neck Pens for my Grandson to use at school as he was finding it very difficult writing, so when I saw the advert in the newspaper, I thought what a good idea. He has found it much better and his writing has improved a lot. To think something so simple has helped left handed people". "My son loves writing now and his handwriting has come on greatly - (geon2008). Best pen I've ever used, immensely impressed - (minysoda). Brill, love it, thanks - (redgrass40). Fantastic, thank you - (dorisdump). - Perfect - (seasidertony). - Fantastic product, recommended A++++ - (webmaster_350). - Excellent item + excellent service = 1 very happy customer. - (acetateblue). - great pen, daughter loves it, hubby will want one now. - (simplycrazy2002). - Great, the left handed 5 year old can now write, wow. - (biffy-yo_4), - Fantastic, my son is delighted, it makes a big difference to his writing, thanks. - (herbbasics). - My son and his teachers are chuffed, thanks. - (chunkymamma). - Fantastic pen + presentation box, very highly recommended, thanks. - (snapdragon-105)". "My son was having great difficulty writing left handed but thanks to this pen he is now writing without any difficulty whatsoever, and also his school work has improved greatly. He is also a lot happier in himself, so thank you for this wonderful pen". "Finally, a left handed pen that actually works. Brilliant!". "This pen is great. I used to hate writing as I found it awkward and uncomfortable, but this pen has changed all that. Thank you Swan Neck Pen". "I never thought I'd see the day when left handed writing was no longer a problem. This pen is heaven sent". "I bought a Swan Neck Pen at the Bristol Balloon Fiesta after being amazed at how easy it is to hold and how writing with it does not leave a black smudge down the side of my hand! Where were you in the late 70's and 80's when I kept getting wrong in English for messy writing!". 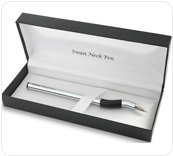 "The Swan Neck Pen is a great and wonderful experience. I find it better for me than a standard straight pen. With the Swan Neck Pen you can achieve a great improvement in your handwriting". "After years of discomfort, I am now writing with pleasure. Absolutely fantastic. Thanks". "I was lucky enough to be given one of the first aluminum pens produced, a collectable of the future! I have shown the pen to numerous clients of mine to try; right-handers and left-handers alike all gave a positive response, and all would like to purchase on launch of this great pen. I have also been given the pink plastic version, for my handbag!". "My Mother-in-Law saw an article in a magazine recently about the Swan Neck Pen, which she sent to me. I bought a yellow Swan Neck Pen for my 13 year old son to try. I asked him yesterday which one of all the left handed pens that I have bought for him over the years did he like the best and he said the Swan Neck Pen, so I have just purchased an aluminium one for him as well as refills and a spare yellow one. Keep up the good work". "This is truly a wonderful pen, the text seems to flow from the nib. I am an Arabic writer, writing right to left. I can actually see what I am writing". "I bought a Swan Neck Pen for my son. Not only has his handwriting improved beyond belief but his general self-esteem has been boosted due to the fact that he can now write properly. His Headmistress at Evercreech Primary, Somerset is delighted. I would like to say thank you to everyone at M.A.D. Associates Ltd for inventing this pen that has quite literally changed his life". "This pen stands out above the rest a truly unique pen, something so simple but so nice. My writing has improved, it's neater, more compact and most of all I can see what I'm writing. It's great!". "I wish this pen had been available when I was at school. This pen not only works, but looks good too". "I love the aluminum pen and it's also recyclable too! My daughter loves the pink plastic pen, she thinks it's trendy and lovely to hold. It also gave her a clear view of her writing".